Outdoor Odyssey is a multi-faceted leadership academy founded in 1998. Our primary mission is to pair area youth with a mentor and provide these teams with a unique wilderness experience at our 500-acre Laurel Highland camp. We incorporate leadership skills, high adventure, and team-building into a week-long curriculum that sets the stage for a year of follow on activity between our mentors and their teams. We provide team builders to all types of organizations, ranging from corporations and universities to high schools and other clubs/teams. We pride ourselves on tailoring all of our team builders to meet your organization’s needs and goals. We strive to provide each group with top notch adventure programming, unrivaled leadership curriculum and superior service. The perfect team-builder for your organization is just a contact away. Check out our 2019 Mentor Recruiting Film on the Video Page! Introducing the Outdoor Odyssey Treehouse! 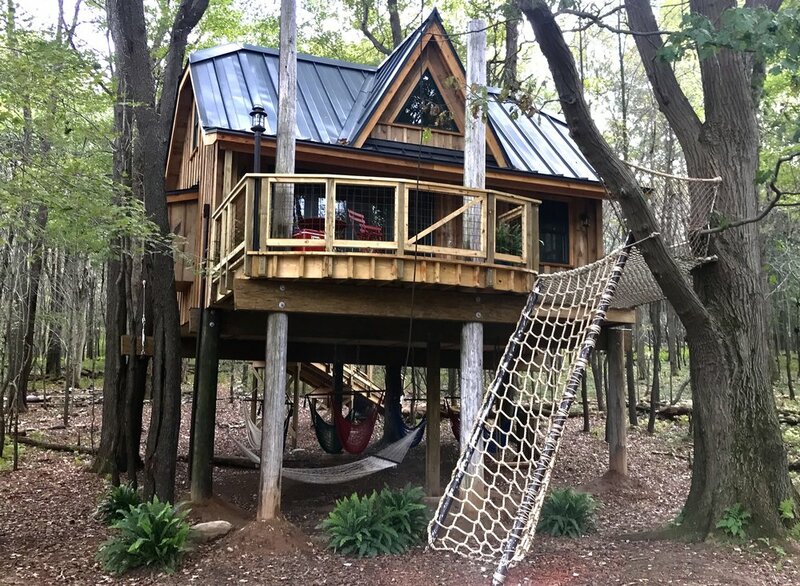 The treehouse was built last June by the Nelson Treehouse team for the television program Treehouse Masters. Now that the episode has aired on Animal Planet (episode 715/Semper Fi in the Sky) we can share it with you! Our plans for the treehouse are only limited by our imagination! A very special thank you to the TC Open Foundation for inspiring and funding this amazing addition to the camp. The space is designed for a multitude of groups to use. Looking for a corporate offsite? Visit Outdoor Odyssey for world class teambuilding from our professional staff and have your company meeting or work session in the treehouse. It truly inspires! Feeling adventurous? Climb the net to enter! Don’t worry if the net’s not up your alley. There’s a ramp for easy access in the back! Ready to take the next step? Sign up your organization today! Click here to donate to our organization and help us continue our mission! A lot of magic happened in only 3 weeks! Check out the recent article in the Pittsburgh Post Gazette about Semper Fi Odyssey!